Key players and experts from the artificial intelligence realm gathered in Dubai on Wednesday at the start of Artelligence - The Artificial Intelligence Forum 2018 - to discuss various topics surrounding the technology and how societies can benefit from it. AI investments in the UAE is expected to hit Dh33 billion in 2017, with the figure growing over 70 per cent over the past 3 years. Business Insider says the government would be using AI to account for around 50 per cent savings in costs. "You need to get your feet wet with AI," Wesam Lootah, chief executive officer of Smart Dubai Government, said in his keynote speech. "AI is not something for tomorrow; it's available today. The possibilities are there, and it can touch every aspect of life." Lootah stressed that machines shouldn't be viewed as threats to humans, especially on the hot topic of jobs. Rather, "machines will complement humans and makes us better with what we do", he pointed out. The two-day Artelligence is being presented by Khaleej Times, the UAE's first English-language newspaper, and MIT Sloan Management Review GCC, with Smart Dubai as the official government partner. AI is practically everywhere — yet we haven't realised its full potential. And there is a lot that we still need to do in order to fully and properly leverage this technology that is already changing the game. The UAE is one of the nations at the forefront of utilising AI to accelerate economic progress and societal happiness — and it has done so with flair, with several key initiatives to back it all up. 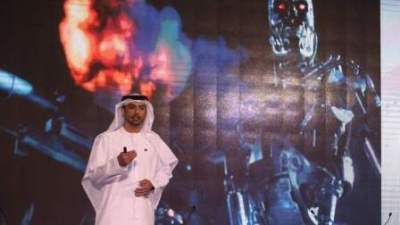 The most telling move of the UAE on the AI front is the appointment of Omar bin Sultan Al Olama as Minister of State for Artificial Intelligence, the first nation to ever do so. The country's Artificial Intelligence Strategy is another world-first, which outlines the nation's plan to ensure innovation and a performance-led environment. This shows the seriousness of its leadership in embracing the potential of AI and what it can contribute to economic development. AI is one of the emerging technologies that is playing a key role in the transformation of society, touching every industry and transforming the way strategies are being implemented. And the race is on to keep in step and even get ahead. But with every new technology, there are concerns about the potential downside AI could have. The AI market is already huge, and it will only grow in the coming years. AI solutions are expected to witness a compound annual growth rate of 55 per cent over 2016-20, according to the International Data Corporation. Meanwhile, Forbes reported that by 2035, the gross value that will be added to the manufacturing sector will be $3.76 trillion. "I think we're going to see an explosion both on the consumer side and government side," Asif Javed, managing director for technology in the Middle East at Accenture, told Khaleej Times. He says that for the former, the demand for devices and services will be headlining this boom, quoting a recent survey by the company showing that consumers in the Middle East especially the UAE are "much more demanding and happier to use these services". On the government side, Javed says that there will be a "laser focus" on innovation and being a leader in AI. Industries are scrambling to have AI as an integral part of its operations. Forbes reported that 40 per cent of firms see the potential to increase their activity using AI. In healthcare, for example, AI can boost certain aspects, including satisfying the need for more personalised services and providing the right treatment to the right patient at the right time. AI is also transforming the way the media world works; technologies such as this can help optimise workflows and make an organisation more responsible towards its audience. "Becoming a smarter media organisation is our priority," Ravi Raman, senior vice-president at Khaleej Times, said in his opening remarks. "We can confidently say that we will be at the forefront of this change." Heck, even Sanbot, an AI-powered robot at the event that kicked things off, had some words of encouragement. "I'm not here to take your job," the diminutive machine said. "Let us all collaborate with each other; we have a lot to learn from each other."